Note: I have written an explanation of this post. 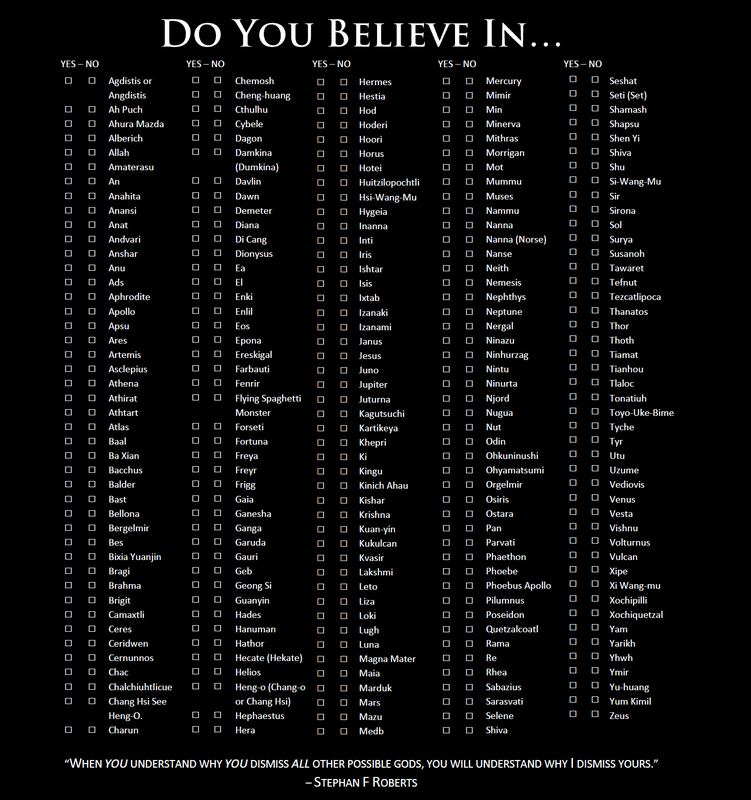 This question is usually posed the other way around, where someone expresses how atheists are like religious people. However, the framing of the question itself creates a bias, namely by insinuating that atheists are inferior and have the burden of proof to show that they are as worthy as Christians. Just consider any time that someone from either camp has argued how atheists have morals too, or how atheists also have faith on some things, or how atheists also experience awe and wonder at the universe. The points are valid, but we shouldn’t have to argue them in the first place. So, this post will run the questions and arguments flipped. Why are Christians as worthy as atheists? Let’s sprinkle some religious arguments in here just for fun. Given that Christians are reading this right now, they are using some electronic device. Perhaps it is the fringe case where they are somehow reading a hard copy of this, which in turn came from an electronic device. Nonetheless, I’m happy to congratulate them. Though they may not know the inner workings of electromagnetism or quantum mechanics—or even believe in them at all—they have managed to willingly use a computer, smartphone, or tablet, which all sprang from human reason. In addition, most Christians wash their hands, are vaccinated, take their doctor’s suggestions seriously, and basically trust science more than anything else in dealing with their health. They probably move around using a car or motorized transport system, also created by science. When on the edge of a tall building, they don’t jump off, because they believe in gravity just like we do. For almost every aspect of their lives, they use science as the primary tool. As shown above, despite their nominal objections to science, Christians obviously still believe in it. Skepticism is a tenet of science, and Christians who embrace science—specifically, all of them—show that they don’t really with absolutely certainty believe in God. They secretly doubt the existence of God, even though they are too afraid to say it, because they are afraid of being socially ostracized. After all, isn’t even an evolution-doubter still using doubt? While Christians comprise 73% of the total US population, only 7% of the elite National Academy of Sciences believes in a god. On the other hand, atheists/agnostics, at 5.7% of the total US population, comprise the other 93%. This means that, picked randomly from the population of the United States, an atheist/agnostic is 170 times more likely to be in the National Academy of Sciences than a Christian. And this is assuming the 7% is all Christian; adding Jews and/or Hindus into the mix causes the disparity to rise even higher. Of course, atheists on average have higher IQs than religious people. Even regarding religious knowledge, atheists score highest, quite ironically (or quite expectedly, depending on how you look at it). But this does not mean all religious people are unintelligent. Some are indeed very intelligent, and indeed, even they can contribute positively to human knowledge. Since I have rarely observed a Christian actually calling for the death of a gay person, despite their divine imperative to do so, I can reasonably conclude that most Christians use reason, not faith, in making moral decisions, and thus have morals too. Of course, this does not mean that Christians are automatically equally as moral as atheists. At 2.4% of the total US population (excluding self-described agnostics this time), atheists make up 0.07% of the US prison population. An atheist is thus 34 times less likely to be in prison than the average American. While atheists understand the relative significance of their roles in this enormous cosmos consisting of billions of galaxies, each with billions of stars, each with chances for planets that contain billions of individuals, Christians find humility much more difficult. They believe that out of all the billions of billions of possible worlds to choose from, an omnipotent, omniscient God chose them to share His love with, that the entire universe was designed for their temporary experience, that out of the stupefying vastness of the universe, they are special. In addition, any Christian who has prayed to God for intervention must think that they know better than God in that instance regarding what to do. “I know you’re kinda the creator of the universe and are infallible and such, but I think you messed up by afflicting my mother with cancer. If you would kindly remove the cancer, that would be great.” Such arrogance to question God like that. But anyways, some Christians, namely the ones who are least Christian and believe the least of all the nonsense, still do have humility. Atheists look at nature and see wonder everywhere and experience awe in the fact that a set of rules with no inherent design could lead to such an amazing world. On the other hand, Christians believe there is a God that is omnipotent, capable of anything, thus everything they see is merely the result of an all-powerful being, so everything is supremely unimpressive. They wouldn’t experience much awe in watching a champion Olympic weightlifter lift a 1-pound weight. Of course, this brings us to the issue of whether a Christian who claims to experience awe is a Christian in the first place. After all, if a Christian proclaims to be in awe, isn’t this Christian really an atheist, since only an atheist can truly be in awe? Of course, if one twists the definitions of awe and wonder, it might be possible that Christians can experience them too, only to a lesser degree. Even though Christians have to always worry about burning in eternal fire, it’s entirely possible for them so believe so strongly that they will be saved that the thought will not trouble them for most of their conscious life. Hence, even Christians can also be happy, even if paralyzing fear is always in the back of their minds. Atheists get to experience genuine love without having to be told. Christians, on the other hand, love because they are commanded to by Jesus, and they desperately want to be on Jesus’ good side when judgment rolls around. It’s hard to call this fake display of affection “love,” but I guess we’ll let it slide. Is it possible to be good with God? I think the answer is yes. Every year, dozens of Christians manage to survive without being racist, misogynistic, homophobic, judgmental, hypocritical, intolerant, superficial, proselytizing, antisemitic, islamophobic, anti-other-faiths, anti-atheist, closed minded, arrogant, or willfully ignorant. So yes, it’s certainly possible. On the whole, Christians aren’t all that different from atheists, and as we can see from above, they’re not that inferior. Given time, they will see the error of their ways, and when they do, we should gladly welcome them into the ranks of the godless. We are all children of evolution, and we all walk the path we are given, and let those who are given more windy paths go on until they again reach the main path towards a better human society. We must meet one another doing good. “But I believe, I’m a Christian!” But do good: we will meet one another there. This is silly. I want people of faith to get it through their heads – I don’t believe in God or gods. It doesn’t create a vacuum of emptiness inside of me, I am fine, I have a nice life with a great family in an empathetic society with a good job from which I pay taxes… And I never, ever credit supernatural beings with my awesome life.